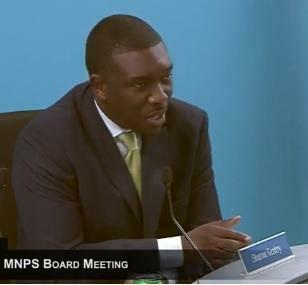 NASHVILLE, Tenn. (OSBORNE) -- Months of escalating tension over the leadership of Nashville Public Schools came to a head Tuesday night as Schools Director Shawn Joseph announced that he will not seek an extension to his current contract. The announcement came on the same day the Tennessee Department of Education revealed it will recommend that Dr. Joseph’s teaching license be suspended for one year. The action comes in response to the system’s failure to report a dozen teacher misconduct incidents as required by law. Dr. Joseph used 25 minutes of the hour-long board meeting to mount a combative defense of his tenure. He also called local news media reports about his work “biased,” and chastised his detractors on the board for impeding his reforms. Board Chair Dr. Sharon Gentry followed with her own ten-minute defense of Joseph’s leadership, but agreed that it was time for him to go saying the “climate” would only get worse if he remained. Dr. Gentry concluded by asking parents and teachers to help her hold on to gains made by the system during Dr. Joseph’s tenure, especially those gains made by students of color. The Nashville School Board has announced that it will vote on a call to dismiss Dr. Joseph April 9. Would you like to view the MNPS School Board meeting that includes Dr. Gentry and Dr. Joseph's full comments?